All the talk from President Obama and the Democrats about standing for the health of women is all FALSE. They do not care. When they say they want to protect the health of women, they really mean they just want to protect the abortion industry and keep killing innocent Americans. President Obama is threatening to end funding for a Texas Women's Health program that helps 130,000 low income women. Wait a second, I though Obama was all about helping women? NOT! You see, Texas will no longer allow money from this program to go to abortion providers like Planned Parenthood. Women in this Texas Health Program still have all options for getting health services that planned parenthood provides, except that the tax money will not be going to pay for abortion providers. You know this was going to make Obama mad because Obama loves Planned Parenthood and will do anything to keep their doors open and the baby mills churning. He even turned his back on the troops in the big government shutdown last year. He was willing to withhold pay from the troops fighting for us because planned parenthood funding was getting cut. Paying to kill babies is more important that paying the troops right? President Obama says that Texas not funding Planned Parenthood in this Health Program limits the choices that women who are in this heath program should have. So what does Obama do to "help" these women who have had their choices limited by big bad Texas? He does the only logical thing and completely ends funding for the health program and tosses the 130,000 in this program out on the street. Yep, Obama does not like that Texas limited health choices so Obama further limits health choices by not funding the program and effectively kicking all these women out of the program. So, who is for Women's Health again? Yep, Obama and the Democrats have been outed. The Republicans are the ones who really do care about the health of Women and the health of babies. Texas wants to help women with this health program and at the same time stop funding baby killers. Obama and the Democrats do not care about the health of women. Obama only cares about funding baby mills, and if the money for funding abortions is restricted, then he turns his back on women by completely defunding the health program. Court Unseals Lawsuit that shows Planned Parenthood of Houston and Southeast Texas Defrauded MILLIONS from Medicaid and Texas Women's Health Program. Texas has good reason to end funding to Planned Parenthood. Not only do they kill babies, they also are deeply involved in scams and are stealing millions of dollars from taxpayers. According to an article written by Karla Dial, a federal judge today unsealed a lawsuit a former Planned Parenthood employee filed nearly three years ago. 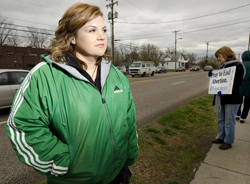 The suit claims that the abortion seller engages in a pernicious and persistent pattern of Medicaid fraud. Abby Johnson, the former director of a Planned Parenthood clinic in the Bryan/College Station area, states in the lawsuit filed by the Alliance Defense Fund (ADF) that Planned Parenthood knowingly sought improper reimbursements from the Texas Women’s Health Program from 2007 to 2009. According to court documents, Planned Parenthood of Houston and Southeast Texas filed at least 87,075 fraudulent claims. As a result, according to Johnson, Planned Parenthood allegedly received more than $5.7 million from Medicaid for services the program doesn’t cover or which were never performed in the first place. What a bunch of distortions! Federal Law requires that poor patients who have Medicaid insurance can see any healthcare provider that is qualified to provide those services. The Texas legislature has chosen to violate that federal law. The position of the Obama administration is that states may not restrict one group of patients from seeing a particular provider because they provide another group of patients legal, constitutionally protected services which they pay for with their own money. Federal money does not "subsidize" abortions, because a) the amount of money Medicaid or Title X pays to get a Pap smear or birth control prescription is so small that private doctors don't want to see these patients (that's why non-profits exist) and b) most of the Planned Parenthood clinics affected DON"T DO ABORTIONS!